This gives triple-bond covalent radii using specific group valencies and oxidation numbers. 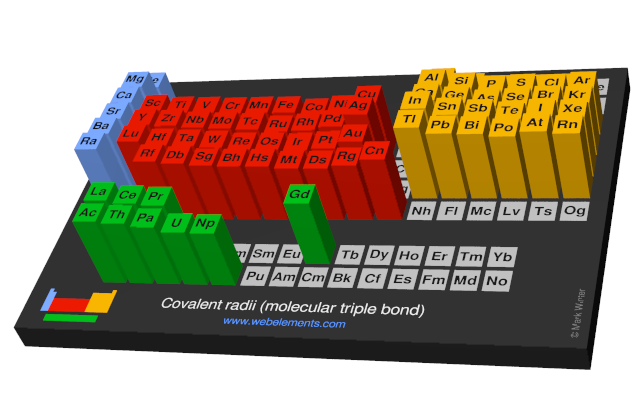 Image showing periodicity of the chemical elements for covalent radii (molecular triple bond) in a periodic table cityscape style. 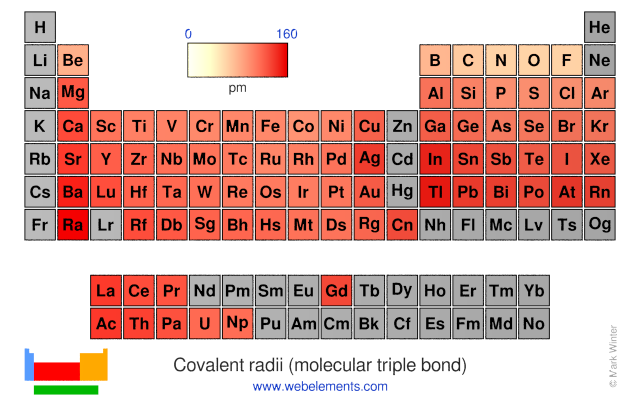 Image showing periodicity of the chemical elements for covalent radii (molecular triple bond) in a periodic table heatscape style. 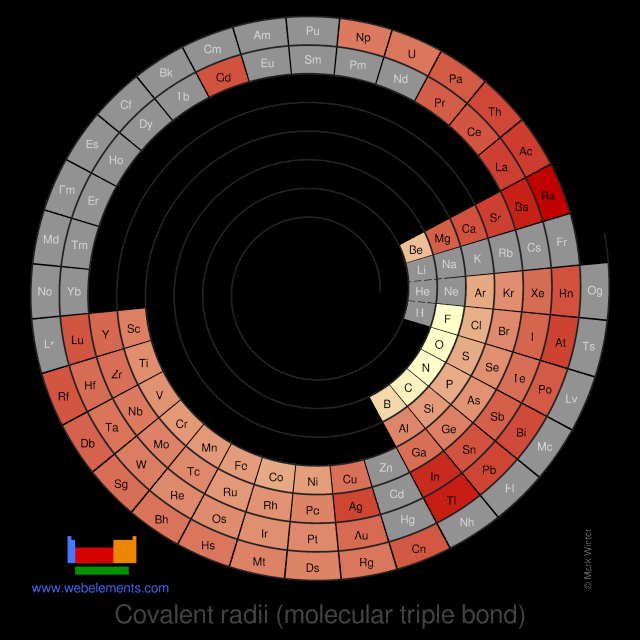 Image showing periodicity of the chemical elements for covalent radii (molecular triple bond) in a spiral periodic table heatscape style. 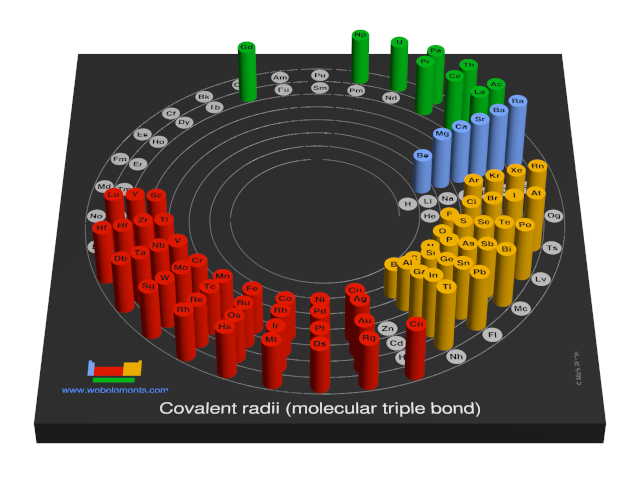 Image showing periodicity of the chemical elements for covalent radii (molecular triple bond) in a 3D spiral periodic table column style. 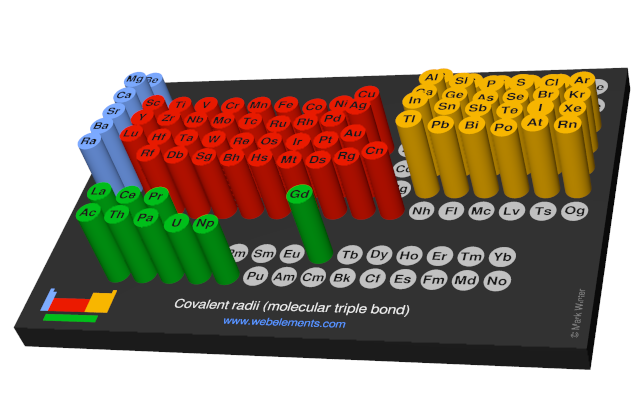 Image showing periodicity of the chemical elements for covalent radii (molecular triple bond) in a 3D periodic table column style. This is a	self-consistent	system	of additive covalent radii, R(AB)=r(A) + r(B), is set up for most elements of the periodic table, Z = 4+112. The	primary bond lengths, R, are taken from experimental or theoretical data corresponding to chosen group valencies. All elements and all admitted data points are treated as equal. Radii were then obtained self-consistently through a least-squares fit. Specific molecular coordination numbers and oxidation states are chosen for each element involved. P. Pyykkö S. Riedel, and M. Patzschke, Triple-Bond Covalent Radii, Chem. Eur. J., 2005, 11, 3511-3520.